The Journal of Clinical Investigation has retracted a 2004 paper by Jacob Hanna, a highly cited stem cell researcher in Israel whose work has been dogged by questions about its validity. Questions about the work, and other articles on which Hanna was an author, were raised on PubPeer last November. This is his first retraction. The retraction stems from “a number of figure irregularities;” the authors say they were “inadvertently introduced,” and subsequent work has supported their data and conclusions. 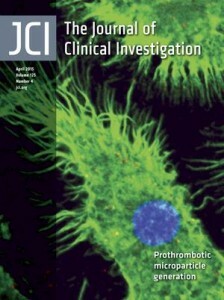 However, due to the “number of serious mistakes,” the JCI editorial board chose to retract the article. Hanna and corresponding author Ofer Mandelboim at The Lautenberg Center for General and Tumor Immunology — part of Hebrew University, in Jerusalem, where Hanna used to work — say they have accepted the decision. Hanna, currently at the Weizmann Institute of Science, studies ways to reprogram cells to become more versatile stem cells. He also spent time as a postdoc at the Whitehead Institute in Cambridge and Mount Sinai, in New York City. Six of Hanna’s papers have been cited more than 500 times, according to Thomson Scientific’s Web of Knowledge. The most-cited, with more than 1,000 citations, was a 2008 Nature paper. The retracted article, “Novel APC-like properties of human NK cells directly regulate T cell activation,” has been cited 121 times, according to Thomson Scientific’s Web of Knowledge. This in vivo analysis revealed that proinflammatory, but not immune-suppressive, microenvironmental requirements can selectively dictate upregulation of T cell-activating molecules on NK cells. Taken together, these observations offer new and unexpected insights into the direct interactions between NK and T cells and suggest novel APC-like activating functions for human NK cells. A number of figure irregularities in this article were recently brought to the attention of the editorial board by the first author and corresponding author. In Figure 1, the ANK and UaNK sample labels were switched. In Figure 2C, the RT-PCR gel shown is identical to an RT-PCR gel shown in the original version of another publication (1). In Figure 3D, the panel showing DR0401-ospA incubated with ANK cells pulsed with HA protein (top left) is identical to the panel showing DR0401-HA pulsed with HA (bottom middle). Also in Figure 3D, the panel showing DR0401-HA incubated with UaNK cells pulsed with HA protein (top right) is identical to the panel showing DR0401-HA incubated with ANK cells pulsed with BSA protein (bottom left). In Figure 8, multiple flow cytometry panels shown were duplicated in the original version of another publication (2). The samples for these panels were labeled differently in the two publications, and in several cases, different antibodies were indicated. The authors have stated that the errors were inadvertently introduced and further that recent experiments support their original findings. Moreover, they also note that their conclusions are supported by other work in the field (3, 4). However, the original data for this article are no longer available, and it is evident that a number of serious mistakes were made in the preparation of this article. Thus, the JCI editorial board is retracting this article due to the numerous errors in data reporting, misrepresentation of data, and image duplication. The first author and corresponding author accept the editorial board’s decision, apologize to the scientific community for the mistakes, and will seek to publish a corrected manuscript version corroborating the findings of this work in due course. In an email to Retraction Watch earlier this year, Hanna blamed figure errors in a 2005 Blood paper (cited as reference #1, above) on the shoddy work of “medical trainees” who botched the job while Hanna was working on an exchange program at Mount Sinai. At the time, Hanna told us he was working to correct that article, but we don’t see any erratum for it yet. The second paper referenced in the note is a 2004 article in the Journal of Immunology, which has also been discussed on PubPeer. Curiously, Hanna and Mandelboim — but none of their previous coauthors — have posted a preprint of a corrected version of the retracted JCI paper on bioRxiv. We’ve emailed both scientists for comment and will update this post if we hear anything. Update 7:27 PM ET: When originally posted, we said the paper was about stem cells; Hanna is a stem cell biologist but the paper is not strictly about stem cells. We have modified the title accordingly. Prof. Hanna, could you be so kind as to please contact all 121 sources that reference your paper to request an erratum for each. Is there precedence for this? I haven’t seen this done before, but I could very well be wrong. It seems a pretty drastic step, no? The JCI board are the only publishers to have shown a bit of backbone in this affair. The papers in the anaemic Blood and immunocompromised J. Immunology are every bit as bad but those journals are content to let them be fixed with errata. Like many other journals, JCI feature regularly in these pages and at PubPeer. It strikes me that in the age of PPPR, a relatively low bar to entry, but vigorous pruning to weed out articles later found to have truthiness deficits is not a bad publication model for a scientific journal. Once such a policy became widely known, it would raise standards by scaring away those who would fear being found out later. If this is the policy that JCI have adopted, I wish them well. A new paper published last week in Nature by Marius Wernig (Stanford), independently confirmed the validity and authenticity of reprogramming obtained in Mbd3flox/- system. It seems that “Ernest” is not so earnest about the Mbd3 connection to this paper. It was noted on PubPeer that nothing in the recent Wernig study validates a functional role of Mbd3 depletion in reprogramming. Correction published in Blood journal as indicated by Hanna. Yes, very much. The work you are referring to is about making progenitors for eggs/sperm from human iPS cells, and it is very exciting and has been just selected among best of Cell journal published papers for the year 2015. Next Next post: Poll: What to do when peer review feels inadequate?